Brown-headed Cowbirds (Molothrus ater) and Bronzed Cowbirds (M. aeneus) are the only obligate brood parasites in North America. These birds don't build their own nests. Instead, they lay eggs in the nests of other birds, depending on the surrogate parent to hatch and rear their young. Some naturalists speculate that because of their nomadic lifestyle (accompanying grazing herds of bison and eventually cattle), cowbirds stray too far from home to reach a nest in time to deposit an egg, so they evolved to rely on other birds. Cowbirds remove one egg, and lay their own in host's nest. 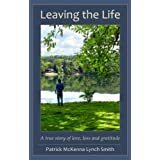 The hosts young often starve to death. Cowbirds lay eggs in the nests of some 214-220 other species. Successful parasitism has been recorded for 144 species. About 20% of Eastern Phoebe and 40% of Song Sparrow nests are parasitized. Cowbirds seem to prefer open cup nests (as opposed to nests in cavities) and the nests of birds that also lay speckled eggs. The sneaky female cowbird checks out nests in advance. They perch atop shrubs or trees to watch for nest building activities, or try to flush nesting birds by flying and landing noisily. Once she locates the nest, the cowbird usually waits until the host has laid two or more eggs, but before incubation begins. The female then sneaks into the nest minutes before sunrise to quickly dump an egg. Egg laying usually takes only 20 – 40 seconds. She typically removes one of the host’s eggs the day she lays her egg in the nest, so the total number stays the same. Some hosts like cardinals may desert a nest parasitized by cowbirds, lay down more nesting material on top of the alien egg, or remove it. In response, cowbirds may go mafioso. A recent study documented that 56% of the time, cowbirds ransacked Prothonotary Warbler nests when the cowbird egg was removed from a parasitized nest. Cowbirds also "farmed" non-parasitized nests, by destroying all existing eggs so the host would build another that they could then parasitize, in order to get their eggs 'in synch' with the hosts' eggs. Unlike the Cuckoo, cowbird nestlings do not oust host eggs or young out of the nest. A cowbird typically hatches at least one day ahead of its adopted siblings. Cowbird nestlings are much larger than the young of their host. The Frankenbaby nestling has a cherry red mouth, which stimulates priority feeding by the host parents. Their eyes open earlier so they are better equipped to detect the presence of parents. Because they are bigger, they can reach up higher when gaping. In one study with one cowbird versus two host nestlings, the cowbird garnered 50% of the food. As a result, often only the cowbird survives to fledging. 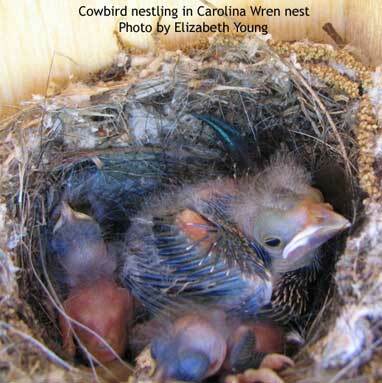 Cowbird young remain dependent on their foster parents for about 16-28 days after fledging. Barbara Burnham said she observed a tiny Chipping Sparrow frantically feeding a Baby Huey cowbird. She (or he) had to fly up off the branch just to reach its big fat beak, then rush off to find more food. Cowbirds pose a threat to the survival of some species whose nests they regularly parasitize, especially those that nest near forest edges, close to open country preferred by cowbirds. Like it or not, cowbirds are native, so they are protected under the Migratory Bird Treaty Act. This means their eggs can not be removed from nests without a permit. Special permits have been obtained to kill cowbirds congregating in enormous nuisance flocks, or to trap cowbirds to protect endangered species like Kirtland's Warblers. In the 1960's, it was found that 70% of Kirtland's warblers nests were being parasitized by cowbirds. The US Fish & Wildlife Service began a program of trapping and removal. By 1980, after removing 40,000 cowbirds, nest parasitism dropped to negligible levels, and Kirtland's warbler fledging rates tripled. BIRD FOOD RECALL: Scotts has recalled certain varieties of Morning Song, Scotts, Country Pride and various private label wild bird and animal food products produced on or before 03/12/08. They discovered these products were treated with pesticides to prevent insect infestations, but the pesticides were not approved for use on animal food. Scotts has contacted stores and asked them to immediately remove affected products from shelves. Thanks to Eastford Building Supply (which did not carry these products) for forwarding the recall notice. Consumers can call Scotts toll-free at 1.888.270.3714.